Deep Blue Professional TransLumen Glass Canopy 36 x 18 TransLumen Glass Canopies are made of super-clear, low-iron Opti-Pure glass to allow the greatest possible amount of light to pass through to the tank, while reducing water loss to evaporation. Deep Blue Professional TransLumen Glass Canopy 48 x 13 TransLumen Glass Canopies are made of super-clear, low-iron Opti-Pure glass to allow the greatest possible amount of light to pass through to the tank, while reducing water loss to evaporation. Deep Blue Professional TransLumen Glass Canopy 48 x 18 TransLumen Glass Canopies are made of super-clear, low-iron Opti-Pure glass to allow the greatest possible amount of light to pass through to the tank, while reducing water loss to evaporation. Deep Blue Professional TransLumen Glass Canopy 48 x 24 TransLumen Glass Canopies are made of super-clear, low-iron Opti-Pure glass to allow the greatest possible amount of light to pass through to the tank, while reducing water loss to evaporation. Deep Blue Professional Glass Canopy Sets Fits 16x08 (5R) DB Glass Canopy Sets come complete with clear cut-to-fit back splash, hinge, and lid handle allowing maximum illumination of aquaria. Deep Blue Professional Glass Canopy/Divider set for 2-Betta tank Glass canopy, plastic handle and divider panel fits #11002 Tall 2-compartment Betta Tank.  Deep Blue Professional Glass Canopy Sets Fits 12x06 (3 Betta + 2-Dividers) DB Glass Canopy Sets come complete with clear cut-to-fit back splash, hinge, and lid handle allowing maximum illumination of aquaria. Deep Blue Professional Glass Canopy/Divider set for 5-Betta tank Glass canopy, plastic handle and 4 divider panels fit #11006 5-compartment Betta Tank. Deep Blue Professional Glass Canopy Sets Fits 20x10 (10R,16R,20XH) DB Glass Canopy Sets come complete with clear cut-to-fit back splash, hinge, and lid handle allowing maximum illumination of aquaria. Deep Blue Professional Glass Canopy Sets Fits 24x12 (15R,20H,25R,30XH) DB Glass Canopy Sets come complete with clear cut-to-fit back splash, hinge, and lid handle allowing maximum illumination of aquaria. Deep Blue Professional Glass Canopy Sets Fits 30x12 (20L,29S,37H) DB Glass Canopy Sets come complete with clear cut-to-fit back splash, hinge, and lid handle allowing maximum illumination of aquaria. Deep Blue Professional Glass Canopy Sets Fits 36x12 (30R,38R,44H) DB Glass Canopy Sets come complete with clear cut-to-fit back splash, hinge, and lid handle allowing maximum illumination of aquaria. Deep Blue Professional Glass Canopy Sets Fits 36x18 (30BR,40BR,50R,65R) PR DB Glass Canopy Sets come complete with clear cut-to-fit back splash, hinge, and lid handle allowing maximum illumination of aquaria. Deep Blue Professional Glass Canopy 36X24 Glass canopy 36x24. Clear hinge & backsplash. Clear handle. For tanks with no center brace. Fits 45 wide and other 36x24. 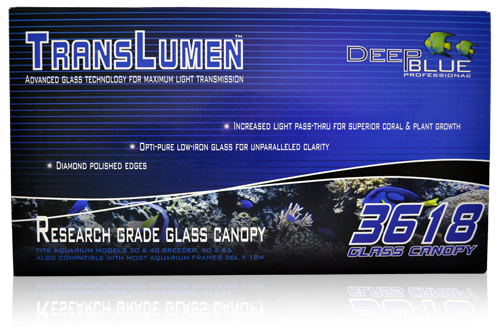 Deep Blue Professional Glass Canopy Sets Fits 48x13 (40E,55S) PR DB Glass Canopy Sets come complete with clear cut-to-fit back splash, hinge, and lid handle allowing maximum illumination of aquaria. Deep Blue Professional Glass Canopy Sets Fits 48x18 (75R,90R,110H) PR DB Glass Canopy Sets come complete with clear cut-to-fit back splash, hinge, and lid handle allowing maximum illumination of aquaria. Deep Blue Professional Glass Canopy Sets Fits 48x24 (80FR,120R,150H) PR DB Glass Canopy Sets come complete with clear cut-to-fit back splash, hinge, and lid handle allowing maximum illumination of aquaria.